you agree to our standard waiver. The MRU runs start at 7:30 am every Saturday. ​For more information contact Ana Romero Jurisson. The ARR Saturday morning run group welcomes all ages and all paces to join, as well as non-members and visitors. Until we have proof otherwise, we’ll claim this is the longest-running weekly run in ABQ. This group was started by the former ABQ Master Runners Unlimited (MRU) club and is one of the wonderful traditions that they brought to ARR. We rotate through seven different routes in sequence. With many different paces, we get spread out along the route, but pause periodically to regroup. Distance can be modified to suit your needs. Map links below show running routes and start locations. Breakfast at a local restaurant follows the runs...optional, but fun!​ We occasionally change the breakfast locations from those marked on the maps. Join Bill Baldwin, Chuck Fuller, and Dennis Muirhead for a track run at Manzano High School on Lomas Blvd east of Juan Tabo NE at ~9:30-9:45 am. (This is NOT Wilson Stadium at the corner of Lomas and Chelwood; it is the track directly behind [south of] the school buildings.) Format varies. Emphasis on "casual." Meet at 6 pm for a trail run in the southern Albuquerque Open Spaces at the Indian School trailhead at the east end of Indian School Rd NE (Google Maps link). We will run 4-5 miles on single-track dirt trails with some steep variations in terrain. The pace is usually 8-9 minutes per mile. We'll regroup periodically to keep everyone on course. There are no water or toilet facilities at the trailhead. For more information, please contact Melissa Tencza at trails@abqroadrunners.com. Meet at 6 pm for a trail run in the northern Albuquerque Open Spaces at the Michael Emery trailhead at the east end of Spain Rd NE (Google Maps link). We will run 4-5 miles on single-track dirt trails; the terrain is more mild than the Monday run. The pace is usually 8-9 minutes per mile. We'll regroup periodically to keep everyone on course. The trailhead has a water spigot and a port-a-potty (sometimes out of toilet paper). 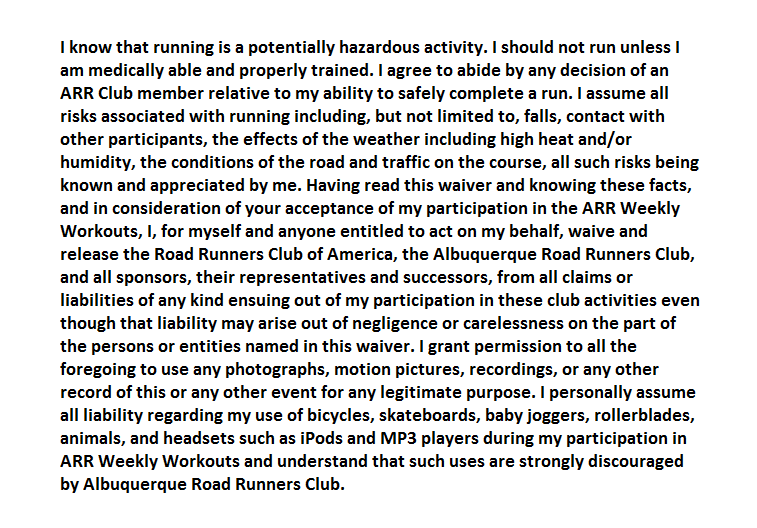 For more information, please contact Melissa Tencza at trails@abqroadrunners.com.